The 2012-2013 season got off to a bit of a rough start for the No. 11 ranked Ferris State Bulldogs over the weekend, as they returned home having earned just one of four points against RPI. Friday's affair saw the Bulldogs pull ahead early in the opening period on a goal by Dakota Klecha, with assists being credited to forwards Cory Kane and Eric Alexander. At the 8:01 mark of the frame, the Engineers' Mark McGowan beat sophomore goaltender C.J. Motte to register the game-tying goal. RPI grabbed the lead for good midway through the second period, when Matt Neal and Guy Leboeuf helped set-up Ryan Haggerty's go-ahead goal. With 1:31 remaining in the contest, the Engineers made it a 3-1 affair on a Jacob Laliberte goal, which came while on the man-advantage. RPI netminder Scott Diebold finished with 30 saves, compared to Motte's 19. 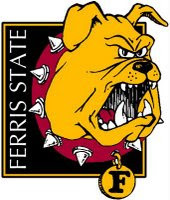 The following night, Ferris State was able to avoid the series sweep by recording a 2-2 tie. Picking-up where he left off from the previous night, Laliberte put the Engineers on the board first with a power-play marker just before the end of the first. 39 seconds into the ensuing frame however, junior forward Garrett Thompson evened-up the score by finishing off a pass from senior Kyle Bonis. Freshman defenseman Brandon Anselmini lit the lamp at the 9:59 mark of the third to put the Bulldogs ahead, but Laliberte netted the equalizer a mere 24 seconds later. Bryce Merriam of the Engineers narrowly outbid Motte in the saves department, 22-21. Ferris State (0-1-1 overall) returns home this weekend for a two-game slate against the Mercyhurst Lakers, with faceoff scheduled for 7:05 pm on both nights. Prior to the start of Friday's game, the Bulldogs will raise their 2011-2012 CCHA regular season championship banner and honor their national championship game appearance at the Frozen Four.